Is Barter Ready for a Comeback? Have you ever traded for something? Perhaps it was a stick of gum in elementary school. Perhaps it was for someone to mow your lawn or paint your house or perhaps do your homework. Barter is ready for a comeback. The exchange (goods or services) for other goods or services without using money. Tom Sawyer, the fictional character, may have been one of the best at creating a high perceived value for whitewashing a fence. Some might call this manipulation and there might be some truth to it. After all, it is just a story. 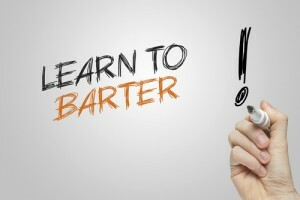 However, the underlying truth is that barter is all about perceived value. Different things have different values at any given time. Would you trade a red paper clip for a house? Well, someone did. Not directly, but it only took fourteen trades to go from a red paper clip to a house. Incredulous? sure. But, it’s also true. You can read about it here or watch a 20/20 segment. The key point is that is a a case of perceived value. I predict barter is ready for a comeback. I’m not sure it ever really left, but it kind of went dormant for a while. I think barter is ready for a resurgence. I’d like to hear how you use barter in your life or business in the comments here too. I predict a comeback for a few reasons. Not the least of which is that people don’t necessarily have the same amount of disposable cash they once had. This is especially true for millennials and Gen Z’s. Also, there is a rise in the Do-it-Yourself (DIY) mentality. There is a corresponding rise is the number of people with a desire to fix stuff on their own. When they don’t have the skills to do it themselves directly … they’ll trade for it. Some people know how to fix mechanical things. Others know the law or how to setup a business. Those with a mind for barter are putting their heads together and seeing what they can do to help each other. It’s that easy to get started into a barter economy. I think everyone has their own reasons for bartering. Some of mine are that it’s fun and it’s empowering. Also, barter serves a purpose. It gets you something in trade for something else without using money. Which is the definition of bartering. As a career move barter might be the secret ingredient people have not thought about too much. This should change. Goods and services can be traded in business too. To Stand Out in Your Career you can become known as an expert in trading for services that help your business while helping someone else’s business. You can be the person that delivers those services or the broker that knows the people that deliver services. There is a wide range of options here for Millennials, Gen Z’s and really anyone to fill. In barter your list of contacts can be as valuable as your skills to provide services. I predict that there are going to be some innovative business launched to maximize the value of bartering. In the olden days barter was common and expected. It was how communities came together to grow and help each other. I think barter is ready for a comeback. It’s something millennials can take on and tweak for the modern age. Imagine an Angie’s List that uses barter instead of cash. Imagine what can be done with smart phones, smart watches and smart payment systems. Where payments can go beyond cash and embrace the idea of barter. What can you imagine? What will you build? What have you built? Do you barter today? Can you imagine yourself bartering for products or services in the near future? Drop a comment here I’d love to hear how, why and what you barter for.